We started today with a little bit of painting. Can you guess what we were painting? More on that in a few days! After a few coats of white paint had been applied we went out into the garden for the rest of the day. Gordon wanted to finish the rabbit run today. It is very nearly finished with just one half of the roof still to do. 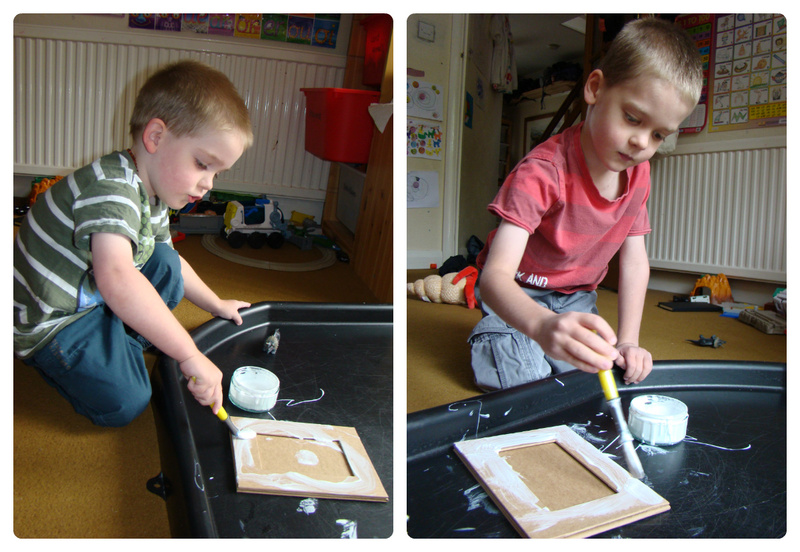 We have been putting the rabbits in it and covering the half with no roof with a towel. Random, but it works! Now the rabbits can get into the run we are trying to get them used to being handled again. We were told that they were friendly and used to being stroked, but they hadn’t been handled much over the winter, but we have found them very nervous. Gordon has been in the run a couple of times, just sitting and letting the rabbits come to him when they felt comfortable and today we let Jasmine go in as well. 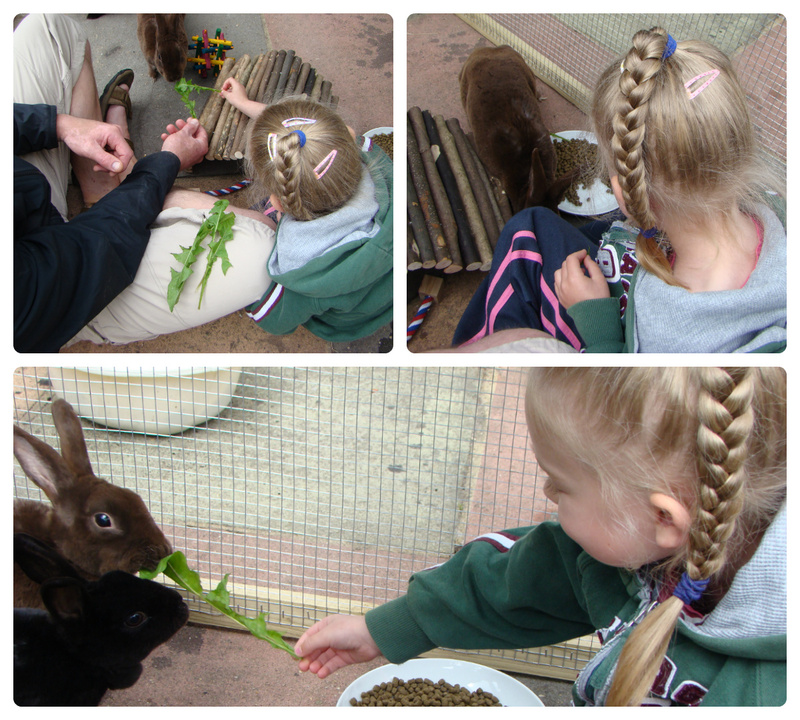 We have agreed that until they are happy to be stroked we are only going to let Jasmine go in with them. The boys are too excitable and I know they would scare the rabbits if we let them go in, which in turn may lead to the rabbits scratching or even biting. Jasmine is very calm and happy to sit and watch. It paid off today and she got to stroke both Star and Chocolate! She was over the moon! I know this is a little unfair on the boys so we do make sure they get to stroke one of the rabbits occasionally whilst Gordon is moving them from the run to the hutch. Once the rabbit encounter was finished I started some weeding in the veg border and Thomas came over to help me. Very soon I had both boys and they were happily pulling up weeds, and doing a really good job too! Eventually though they wanted to plant something. I suggested they could plant some of the weeds in their mud patch but they didn’t want to do this, they wanted pots to plant in. So we got them a couple of pots and all 3 kids chose a weed to plant! I was also pulling up Nasturtiums that have grown from last years seeds and moving them to the wall baskets and the other border. As there were several plants that needed moving Jasmine and Ben got one of these each as well. Thomas chose not to have a Nasturtium because he “only wants weeds”! 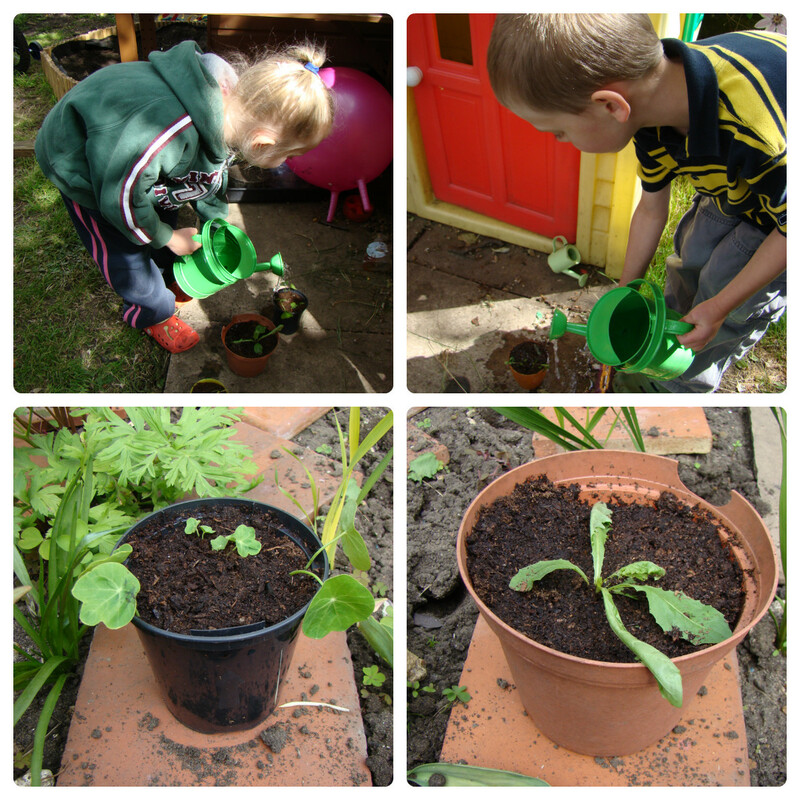 The kids all filled their own plant pots with compost and planted their chosen plants. They watered them and placed them in the sun to grow. While I carried on weeding the kids all moved off to play. Jasmine went over to the mud kitchen and busied herself catching flies in jam jars as usual! She has also made herself a little garden in a seed tray and any worm, centipede, ant or such like that she catches gets moved in here! Most of her bugs don’t stay for long but I think some of the worms stay and today she also found two spiders had moved in! 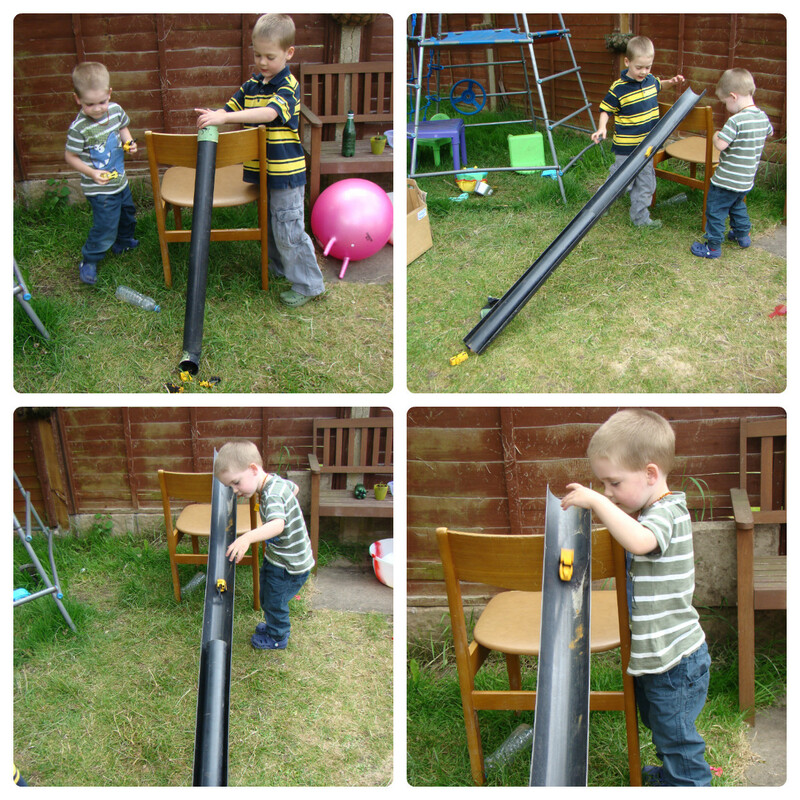 The boys got out some old draining pipes and cars and made ramps for the cars to speed down. The draining pipe was also used as a seesaw and a balance beam, but mostly it was used for cars! And that was our day today. Making the most of the garden while the dry weather remains. What fun from simple things. Planting weeds, now there is something you don’t see too often, at least they are contained in a pot! I love the ramp, you could also try a bat with it and play splat the rat, I’m liking this idea with mine! Thank you for linking up to Country Kids. LOL, I know! Weeds are a winner with my kids! What is splat the rat? I’m guessing it involves trying to hit something as it travels down the ramp? Thomas would love that idea too! Fab! We love playing with drainpipes too. The weed planting really made me chuckle! My boys made a “Beautiful Hedge” by poking millions of dandelions into it- who says weeds can’t be loved!